The preparation of these compounds is shown in reactions (8-43) and (8-44). It is possible to use the Diels-Alder reaction to prepare a whole series of potential insecticides simply by varying the diene and olefin. Mirex, another insecticide, is prepared by the aluminum chloride catalyzed cyclodimerization of hexachlorocyclohexadiene, as in reaction (8-45). It is one of the most stable known organic compounds and has a melting point of 485°C. The endo adduct shown in reaction (8-46) is the major product resulting from the Diels-Alder addition of a diene and an olefin. No intermediate has been detected, but the reaction product can be rationalized as having originated from a transition state in which there is maximum interaction between the tc bonds of the olefin and diene. 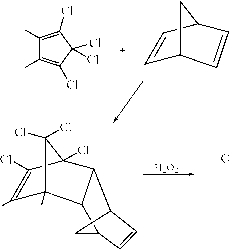 This is illustrated in reactions (8-46) and (8-47), in which the upper cyclopentadiene may be regarded as the olefin, and the lower cyclopentadiene, the diene. The cyclodiene insecticides are very resistant to environmental degradation. One might expect that the tertiary, allylic chloro groups at the bridgehead carbons would be especially susceptible to SnI hydrolysis or El elimination [see reaction (8-14)]. However, the rigid geometry of the bicyclic ring system prevents carbocation formation, as shown in reaction (8-48). A carbocation is more stable if the positive central carbon atom and the three substituents attached to it are in the same plane. It is not possible to obtain a planar carbocation intermediate at the bridgehead carbon atom of these compounds without introducing extraordinary strain in the bicyclic system. Consequently, the chloro groups at the bridgehead position are quite unreact-ive. Some of the cyclodiene insecticides are susceptible to oxidative attack by soil microorganisms, plants, and animals, and by UV. However, the resulting products, such as the one illustrated in reaction (8-49), are often more toxic than the starting pesticide. Photodieldrin, shown in reaction (8-50), is formed by the action of ultraviolet light (UV-B, 290-320 nm) as well as by the action of oxidase enzymes on Dieldrin. 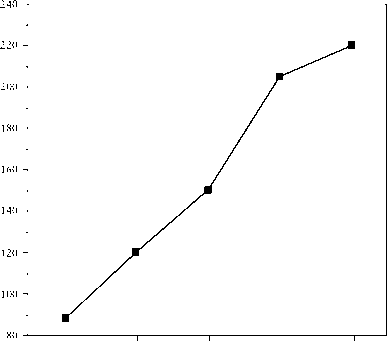 The photoproduct of heptachlor is more resistant to environmental degradation than heptachlor itself. Aldrin, dieldrin, heptachlor, and chlordane have been used to kill grubs and other soil pests and were applied mainly to corn and cotton. Dieldrin has also been used to control the anopheles mosquito. The mechanism of action of these bicyclic organochlorine compounds is similar to that of DDT. However, their toxic effects as insecticides suggest that the site of action lies in the ganglia of the central nervous system rather than the peripheral nerves that are affected by DDT. Mirex has a long lifetime in the environment and a half-life in mammals of about 10 years. It was used extensively in the southern United States in the 1950s and 1960s in an attempt to control the fire ant, an accidentally introduced species from South America. Fire ants live in large colonies in mounds they construct in pasture land. Humans and livestock that step in the mounds are aggressively attacked and bitten by hordes of fire ants coming out of the mound. At one point attempts were made to control the fire ants by using World War II bombers to drop a mix of ant food and mirex on pastures. This killed not only the fire ants but also all the other ants and many other insects as well. When the plan failed to eradicate the fire ant, the Mirex treatment was terminated. Since the fire ant has a more efficient mechanism of recovery than the indigenous ants, it took over the fields that had been treated with Mirex when the pesticide was washed away. So the Mirex eradication plan actually enhanced the spread of the fire ant by killing the indigenous ants that were the barrier to its rapid spread throughout the South. Because of their potential danger as carcinogens and because they accumulate in fatty tissues of birds and mammals, the Environmental Protection Agency has terminated the use of mirex (1971), aldrin and dieldrin (1974), and heptachlor and chlordane (1976). Exemptions for use in special instances have been granted. An example of an exemption gone bad resulted in the contamination of milk in Hawaii, where a request for the use of heptachlor to control aphids (mealybugs) on pineapple plants in was granted in 1978. The aphids cause "mealybug wilt," which withers pineapple roots. The aphids are carried to the pineapple plants by ants which, in return, collect the "honeydew" produced by the aphids. The aphids were controlled by killing the ants with Heptachlor. At the same time heptachlor was being used, agricultural scientists were working on a procedure to use pineapple plants, after the pineapples had been harvested, as cattle feed. The plants were not supposed to be fed to cattle until one year after the last application of heptachlor, but in 1982 this procedure was not followed. Consequently, high concentrations of the hydrophobic heptachlor ended up in the milk of the cows that were fed the pineapple plants, and the contaminant was passed on to those drinking the milk, mainly children. These high levels were detected in the semiannual screening of pesticides in milk by the Hawaii Health Department.